Assuming you’d like to know how to pick up girls in any situation, the fastest way to learn is to watch other guys do it first. Learning from other men is probably the best way to go about it if you’ve never done it before. The odd thing is that if you ask a guy who’s naturally good at picking up girls to describe what he does, he probably won’t have a clue. That brings me to my biggest tip when picking up women: Don’t think about it and certainly don’t think about the possible outcome. When you first walk up to a woman, if you’re concerned with if she likes you or not, then you’re almost always going to fail. Doing this will cause your body to tense up, your hands to be sweaty and your mind will likely draw a complete blank. All this is because you care about the outcome! Instead, if you walk up to a girl without caring about what she thinks at the end, you’ll feel much more confident, you will find an abundance of things to say and consequently, your chances of success will skyrocket! Although it’s perfectly normal to be slightly nervous, you’ll learn that the most successful guys are actually usually pretty calm about the whole experience. Guys forget that picking up girls should be a fun and enjoyable experience for both you and the girl in question. If at any point you start feeling awkward, then you’re doing it wrong. Once you managed to convince yourself to be detached from the outcome ,the simplest way to learn how to pick up girls is to go out and try different approaches! I know it might sound ridiculous at first, but the truth is that you really need to start approaching women on a frequent basis in order to successfully learn how to pick up girls. Start with an opinion opener approach, go up to a girl and ask her for her opinion on something, proceed from there. Go up to a girl and talk to her about a certain situation you’re in, tell her you’re waiting for your friends to come arrive. Accidentally bump into a girl (gently) as if you were going somewhere else and say hello, act clumsy. Walk up to a girl and pretend you recognize her from somewhere else, when she objects, continue the conversation. Find something extremely unique about a girl and then compliment her on it. Find something funny about a girl and then go tease her about it. This is my favorite one. Once you’ve tried all these pick up techniques, you’re likely to have a better understanding to how women react to different approaches. It might be a little rough at first, but eventually things will get smoother as you go along. This is one of the most overlooked and yet important aspects of pickup in general: When you approach girls, YOU must be the one choosing her. The first time you’re going to be chatting with a woman, she’ll already know that you’re trying to pick her up. There are probably many guys that have already tried (maybe even today) and many more will after you’re done. What’s going to make you different is that instead of trying to get her to like you, you’re going to see if you like her instead. On one hand, you’re supplicating to her, trying to impress her and putting her up on a pedestal. On the other hand, when you’re choosing her, you’re actually there to find out if you like her or not. That’s why it’s very important to know what you want in a girl before you go out and pick up women. When you know what you want in a girl, you’ll be actively seeking it and therefore women that are pretty but have no personality won’t impress you as much. Instead, when you know exactly what you want in a woman, you can go into a situation and figure out if she’s a good match for you. When you walk in with that attitude, you never run out of things to say. So my suggestion is to make a list of your ideal girl. Figure out not only how she looks, but how she acts as well. Then once you have this ideal girl in your head, go out and find her. That’s what pick up should really be about, finding your perfect girl. When you’re out with women, just have a good time. In the end, isn’t that what it’s all about? If there’s one thing that I’ve noticed, it’s that if you’re having the time of your life, then they are likely to have a great time as well. Happiness is contagious! Notice that all the guys that are good with women are usually very charismatic, happy individuals. So go out and be that person, don’t think about how to pick up girls and women will love you for it. I really liked this advice, be detached from the outcome! Good run down of the different openers a guy should do. I think it’s interesting the way you want them to simply go up and open even though they aren’t prepared for it. It’s kind of like pushing someone in the water when they don’t know how to swim. It works, but it’s scary as hell ! Good advice, solid. I’ll be trying those out tonight when I’m picking up (or trying to) at the club! Glad to be able to help ! 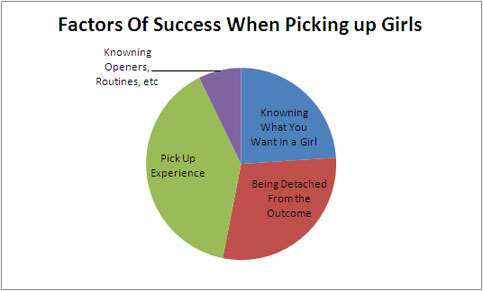 Good article on picking up girls, I just finished reading approach tips and they really compliment each other well. Great little article, love the chart… it’s the pick-up pie. most important is definitely getting out there and approaching women… like over 90% of guys just don’t do it… no wonder you feel anxious about finding a girlfriend when you don’t approach. It’s unimaginabely scary just to walk over to a woman and say “Hello, I saw you and I just wanted to say “Hi” “, when you have never done it yet. Isn’t that a bit too hard?